I had been getting very frustrated with life in Liège – the academic side of it, mostly, but I guess there are some other problems. 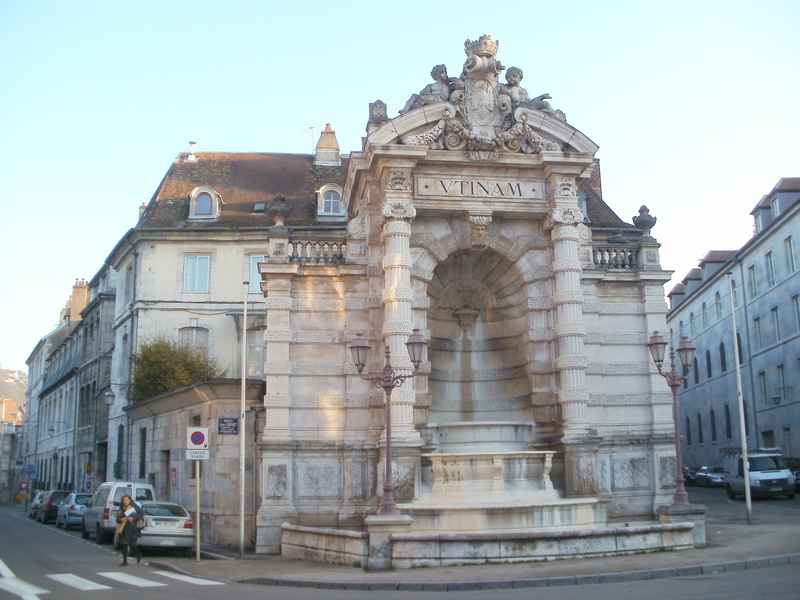 I got in contact with a friend from my home university who, it transpired, was feeling similarly, and she invited me to stay with her in Besançon, which is in the Franche-Comté region of eastern France. I booked a coach which departed at midnight the following day, and hoped for the best. It was a very surreal experience, that coach journey. I had been waiting in the freezing cold on my own, not even sure I was in the right place. The coach arrived, and it was almost full, to my surprise. I sat down, and after a while I tried to sleep, but it was no use. I was in a half-awake state, the darkness outside clashing with the artificial lights of motorways, and a jaggedy sense of not quite knowing where we were. I’m sure that I dozed off a few times, and when I woke up I squinted at roadsigns and registration plates we passed and thought, “We’re still in Belgium?!”. For a country that everyone goes on about for being so small, it does have a certain sort of density. Stopping at a French service station at 4am was strange. It was almost identical to the ones we had been at to sit down for a picnic on family holidays when I was younger. Seeing it as an adult, and not as a child to whom it was somewhere my parents would hopefully buy me snacks at, was a bit of a reality check. After that break, the driver started asking everyone if they were headed for Switzerland. I just nodded, as I knew that my destination was somewhat near the border, and I assumed we’d stop along the way. But then, I began to worry. What if we didn’t stop? What if I woke up and I was stuck in Switzerland with tired eyes, a heavy bag of health food, and a wallet full of the wrong currency? I guess that would have been an adventure of a whole different kind, but we arrived in Mulhouse, much to my relief, at about 06:45. From there, I booked a train ticket to Besançon. The journey was absolutely lovely, giving me a real sense of being away – valleys, mountains, streams, sweet-looking houses, villages with German names (this was in the Alsace region, which has been disputed territory pretty much since the dawn of time). As soon as I stepped off the train to go and meet my friend, I knew that this was going to be a much different student experience to the one in Liège. As I mentioned, the scenery is not at all the same. And of course, France as a country is just very different to Belgium. As a nation it has existed longer, it’s bigger, and there is no prominent identity crisis amongst its people – or at least, not in the same way as there is between the Flemish and the Wallonians. In comparison to Liège, the services and buildings seemed a lot cleaner and more well-established, I suppose. Also, when I caught the bus into town, I immediately heard two separate groups of English people sitting around me (talking about the TV programmes they were going to catch up on over Christmas, if you must know). And as my friend and I wandered through town, we bumped into another person we know from Leicester (there are five of them there in total!). Where I am, there’s just one other student I knew already, and the two other English people I met through her. However, my friend’s accommodation was a stark contrast to mine. It cost about a third of what mine does, but she admitted she got what she paid for. 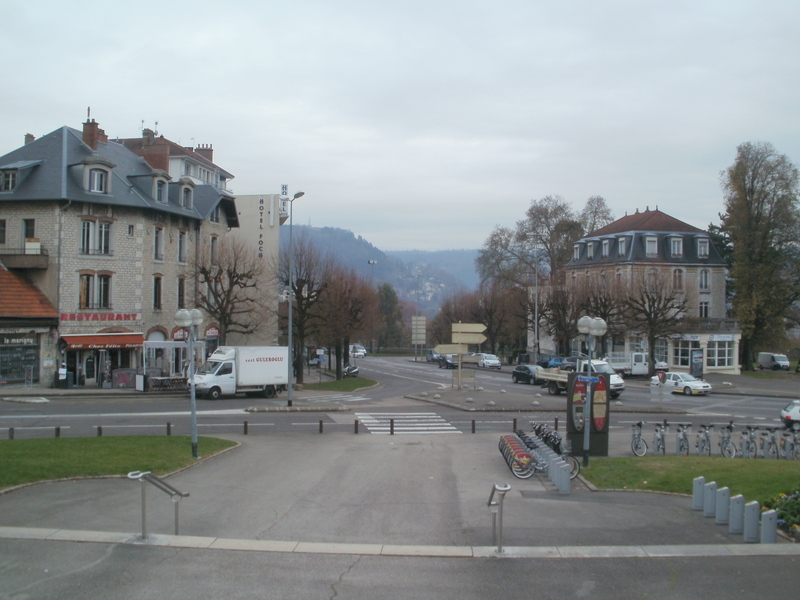 She is the only non-French person on her corridor, and although in theory this is good for language practice, and she isn’t on bad terms with any of them, she said that people were generally not very eager to have much conversation – the majority of them went back to their families’ homes at weekends. It seems that university is sort of an extension of school there, in this respect – and indeed, many people go to the nearest university to where they grew up. In the UK, it’s the opposite… people take a lot of time considering different courses, and they want to get as far away from their parents as possible, it seems. 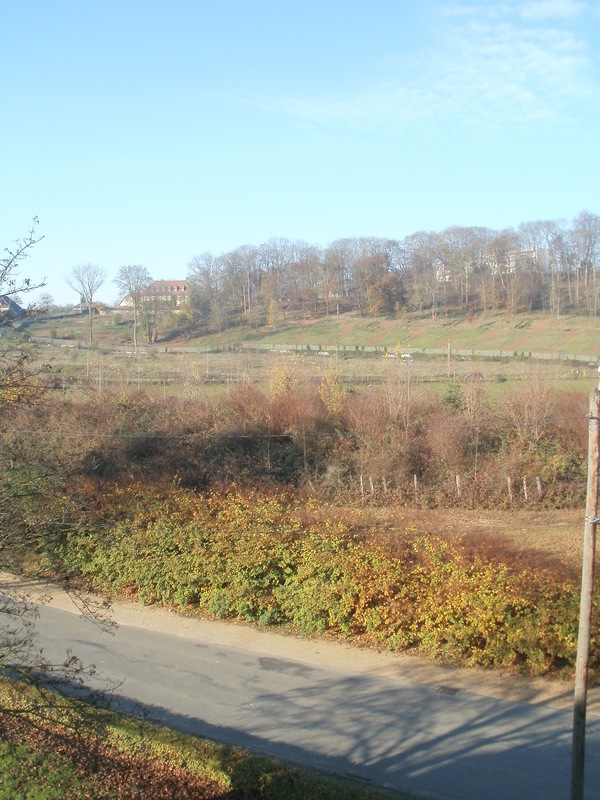 As the picture above suggests, the student accommodation was quite in the middle of nowhere. Besançon itself is a lovely town, if a little far from anywhere else and quite poorly linked for travel (my friend was lamenting how she make a train journey full of detours to go all the way to Geneva to fly home!). It’s got a few boutique shops and things to see, and a few of the usual shops you’ll get in most French towns, and quite a nice cinema (where we saw a Belgian film, funnily enough). There is also a citadel which is apparently quite well-known, but in the end I didn’t go up there. 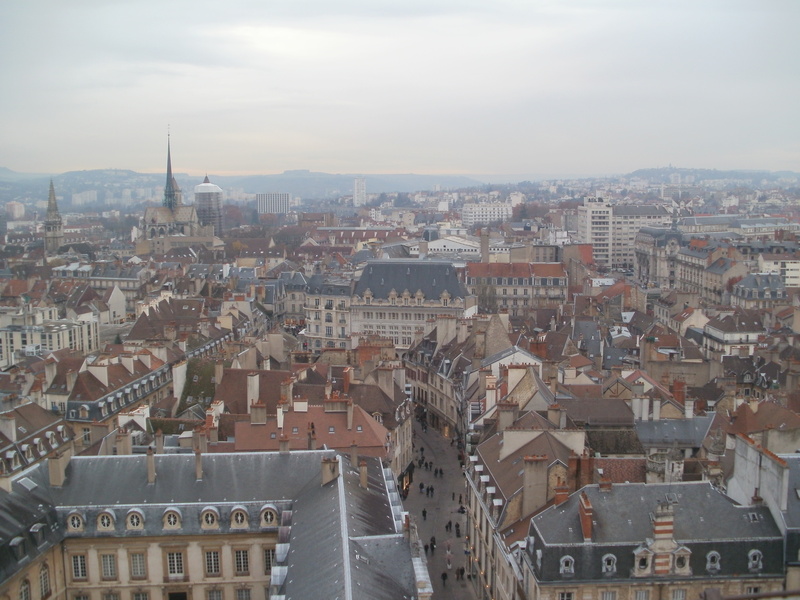 We made a day trip to Dijon, a town in the Burgundy region, about an hour’s train journey away – which, by the way, was outrageously expensive, at a student price of 24 € return (unlike in the UK, where a return journey can be as little as 20p added to a one-way ticket, in France you have to buy each ticket separately at the full price). 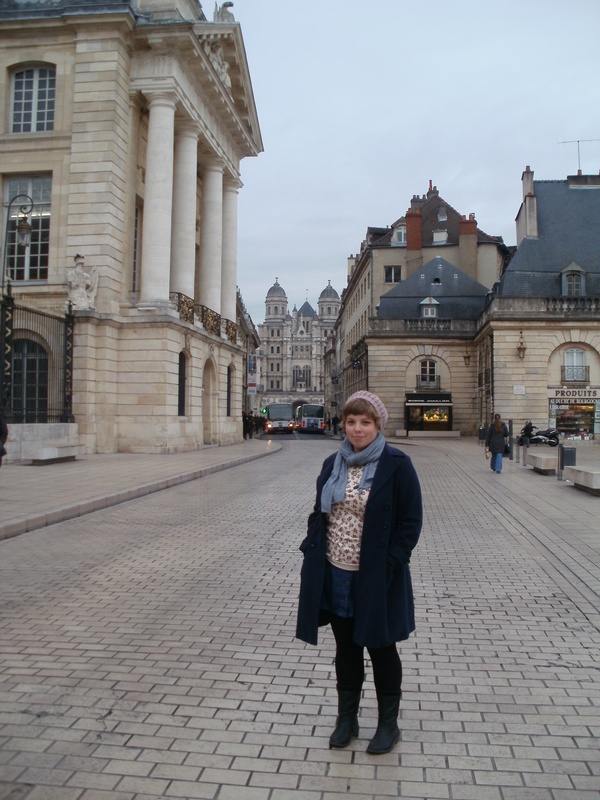 This is me at the Place de la Libération, Dijon. 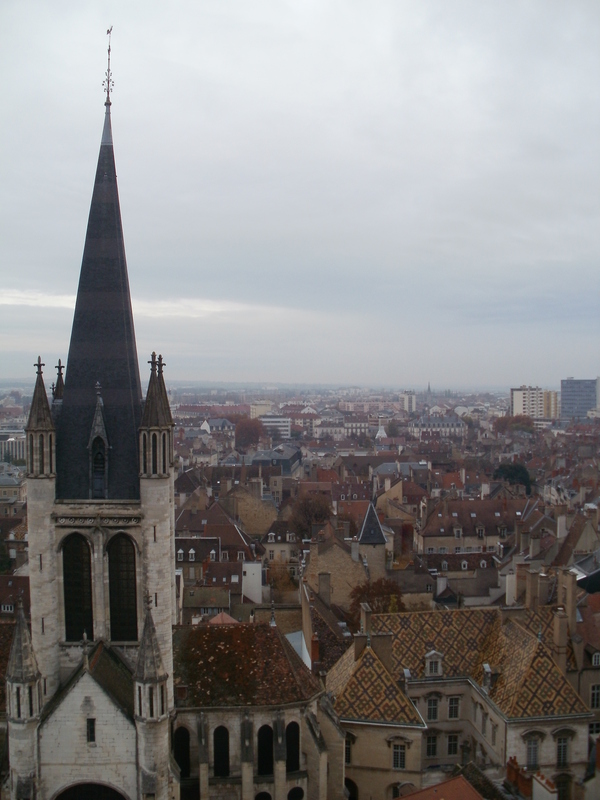 You can see the Cathédrale St. Bénigne in the background, too. We went to a restaurant for lunch and I was delighted to find that I could get a vegan lunch – a varied salad, complete with the local vinaigrette, and some fries. All in all, it was lovely to get away and of course to see my friend. It was also pretty insightful to see first-hand what someone else’s Year Abroad experience was like; it was comforting to know that I wasn’t the only one experiencing difficulties. The trip also rekindled my interest in France, I guess.